This topic shows how to use the Analog Input Recorder app to view and record data from an NI USB-6218 device. 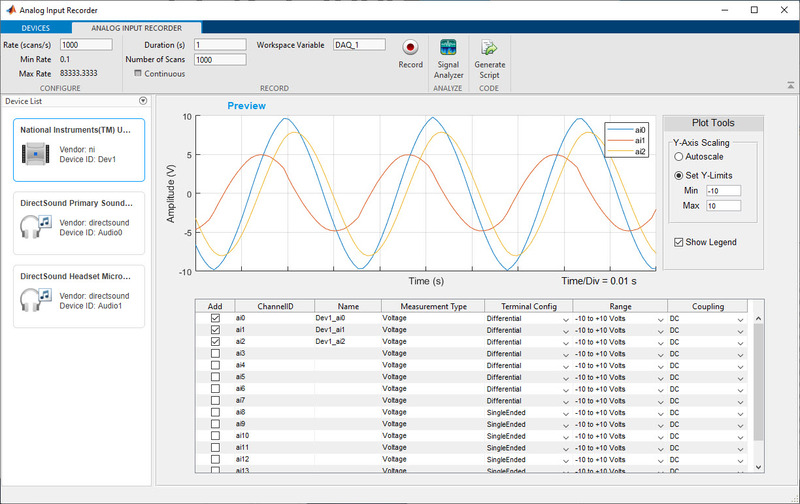 To open the Analog Input Recorder, on the MATLAB® Toolstrip, on the Apps tab, in the Test and Measurement section, click the Analog Input Recorder. Upon opening, the Analog Input Recorder attempts to find all your attached analog and audio input devices. The data acquisition session created by the Analog Input Recorder is not accessible from the MATLAB command line. Select the device you want to use in the Device List. The app immediately starts a preview of the analog input using default settings. Modify any scan and channel settings for your specific needs. The following image shows the app displaying three channels of the device. Notice that the Max Rate value has changed with the number of channels; this relationship depends on the device. Set values for Number of Scans or Duration, and Rate. Check Continuous if you want to override the duration or number of scans. In this mode, recording will continue until you explicitly stop it. When you are ready to start recording data, click Record. When recording is complete, either because the specified number of scan is recorded or you click Stop, the logged data is assigned to the indicated MATLAB Workspace variable. By default, the variable starts as DAQ_1, and its name is incremented with every recording, but you can specify any valid MATLAB variable name. The variable is assigned an M-by-N timetable, where M is the number of scans and N is the number of channels. 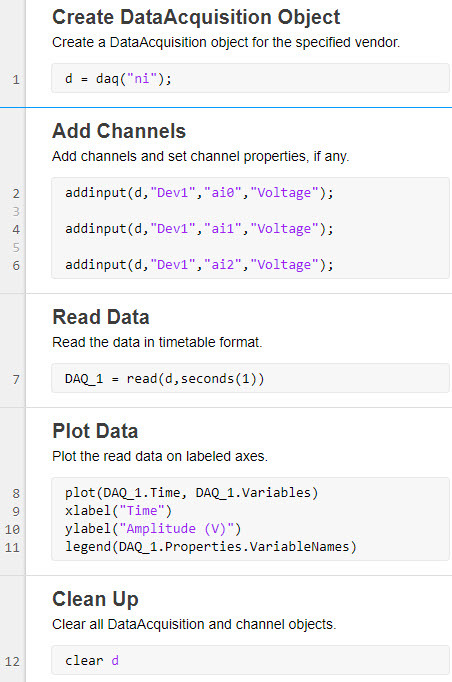 The following commands show the beginning of the acquired timetable for a multiple channel recording. View the first four rows of the timetable. In the Analog Input Recorder, click Generate Script for the app to open the MATLAB editor and display the code for recording data. The following code is generated for the finite (non-continuous) 3-channel recording of this example. Notice that this code uses the startForeground function; a continuous recording would use startBackground.